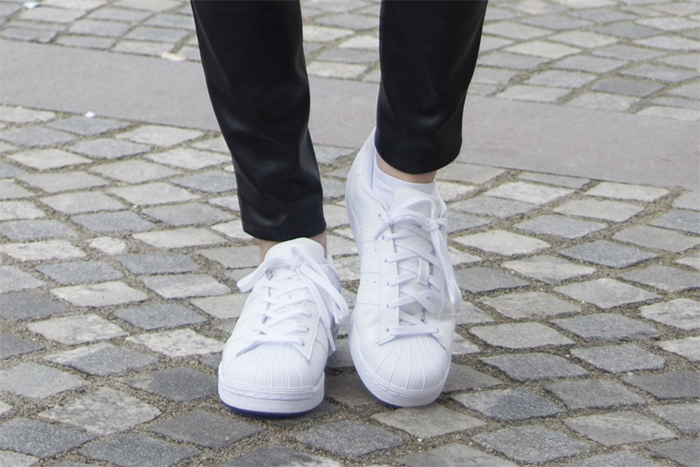 I must say, for quite some time I couldn't decide on this whole white sneakers trend. Even though I really like the whole sporty trend, it might be the fact that they reminded way too much of high school (I used to live in Adidas sneakers) and they seemed just a little bit too much for my style. Until now of course. As my taste changes all the time, the sneakers trend pretty much grew on me, so after skipping the whole "Stan smith obsession" I decided to go for the good old Superstars, bringing back some memories and definitely creating a new ones! Love this outfit & these sneakers !! & these leather pants are amazing !